What a surprise to find this snapshot in a box of junk I retrieved from my mother's house. 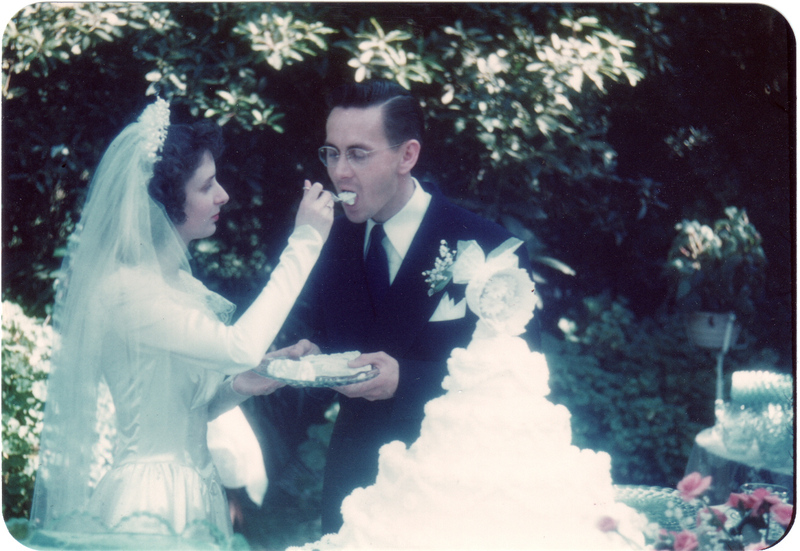 Here are Mom and Dad on their wedding day, sharing their first meal as husband and wife. They are so young! So thin! (Mom weighed less than ninety pounds that day.) They look sweet, but very serious. Dad is concentrating quite intensely as he bravely confronts the enormous chunk of cake Mom is trying to guide down his gullet. When I mentioned this picture to Mom, she told me she learned an important lesson that day. When feeding someone, you need to make the bites very, very small. Your mom is a smart lady, Rosemary! I guess it all depends on what we're trying to feed him too. As you get to know someone, you know that some things are easy to handle, and some things are barely palatable. I just love that photo of your parents. I hear you, Tammy. I could probably write a book about family life with my parents, using the metaphor (and the reality) of what people will/won't/must eat as a recurring theme. But I don't think that's the book I'm going to write. It is a really sweet photo. Ha! These situations take a surgeon's steady hand. I can hardly believe I was foolish enough to try to compose and play a wedding march for our own wedding! But I am glad I did and I am glad I am (so foolish). Yes, there really is more than one way to peel a potato or fold a towel. Love this! Last weekend, my hubby and I renewed our vows and we fed each other cake for the first time. He got it all over the side of my mouth and had a blast licking it clean :).